Who really pays for American students to go to college? is an assistant professor of history at Loyola University Chicago. Her latest book is Sunbelt Capitalism (2013). Individually, Americans spend a lot on higher education. Most undergraduates finish with about $30,000 in debt. It’s an average that calls into question how much voters, educators and policymakers have done to support the country’s colleges and students. Americans instead nurtured a student‑loan industry whose debt totals account for more than 6 per cent of the United States’ GDP. Decisions made in the Great Depression can be partially blamed for the trillion dollars alumni now owe. That 1930s catastrophe threatened to shutter scores of colleges and universities because most schools, be they public or private, depended on tuition. President Franklin Roosevelt is now remembered as a big spender but he never tried to directly bail out the academy. Many college presidents and trustees hated his New Deal, whose aid programmes came with federal regulation and oversight. They thought education was best left to state governments, religious denominations, private philanthropies or educators. So the Roosevelt Administration provided more than 600,000 students with the chance to study in college – if they worked. The National Youth Administration (NYA) spent $93 million on a programme intended to help unemployed young people gain the skills needed for better-paying work in the future. NYA heads also designed ‘work-study’ to indirectly subsidise schools. Policymakers directed applicants to any school willing to accept federally assisted students who could pay tuition because the government paid them to work part-time improving and expanding campuses. Washington, DC never stopped using student financial aid to subsidise universities. The much-celebrated GI Bill was no exception. Also known as the 1944 Servicemen’s Readjustment Act, it provided a generous stipend for living expenses and books. Veterans, after all, had already earned their entitlement to an education. But the Veterans Administration sent tuition payments directly to schools willing to accept service personnel. Many institutions, particularly in the Ivy League, were loath to do so. The University of Chicago’s president spoke for many when he warned that working-class and minority GIs would turn colleges into ‘hobo jungles’. GIs proved such educators wrong. Veterans were in fact more eager, studious and capable than their civilian classmates. Servicemen also brought much‑needed cash to campuses. The federal government set the maximum tuition reimbursement at $500, far more than even Harvard cost. Liberals designed that high ceiling to encourage schools to raise rates. They hoped extra revenue would fund expansions to accommodate the tidal wave of GI applicants. Colleges, of course, raised fees. But they charged everyone, not just veterans, more. Roosevelt and Harry Truman appointees never realised this scheme would put college increasingly out of reach of non‑combatants. Nor did policymakers predict that Congressional conservatives would refuse to let federal education bureaucracies administer these benefits. They made sure that task fell only to the Veterans Administration, whose mission to help only service personnel complicated Democrats’ hopes that these educational entitlements might someday be extended to every American. The GI Bill also accidently ensured that higher learning became increasingly costly. Liberals spent much of the early Cold War trying to federally underwrite universities. Conservative opposition remained strong even after the Soviets launched Sputnik in 1957. After a year, Congress and the then President Dwight Eisenhower could agree only on a programme that meagerly underwrote teacher‑training, science and engineering in the name of national defence. College students promising to study in those fields might win a small fellowship, but they could more easily take out a small, short-term loan directly from the federal government. Lending also rounded out the 1965 Higher Education Act. President Lyndon Johnson, formerly head of NYA’s Texas branch, considered this bill a way to complete the New Deal and build his Great Society. As written, the law prioritised directly funding campus needs. The ‘student assistance’ title seemed almost like an afterthought. The federal government sent a chunk of money for schools, whose campus financial aid officers figured out aid packages tailored for each individual student. By design, no young person received a free ride. Instead, an undergraduate had the opportunity to cobble together tuition payments through grants, work-study opportunities and loans. But the federal government wasn’t the lender. Money came from private bankers instead, whom federal officials put in touch with school administrators to work out an individual student’s financing options. 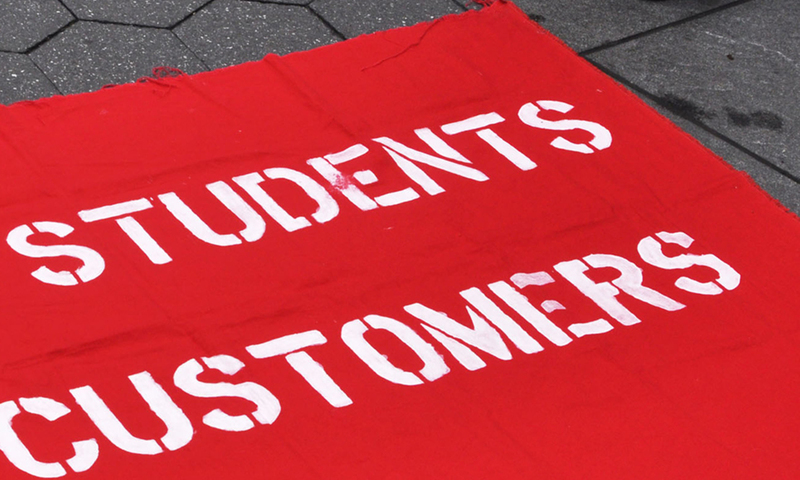 The Higher Education Act subsequently did at least as much to birth the modern student‑loan industry as provide actual financial assistance to schools and students. Universities quickly embraced federal student aid as a means to compete for top students, irrespective of need. This abuse enraged Senator Claiborne Pell, who insisted that the Higher Education Act’s 1972 reauthorisation include the direct, federal, need-based grants later named after him. That ballyhooed programme didn’t guarantee every American a chance for a higher education, as Pell promised. The basic grants never received full funding. The most important 1972 change was the creation of Sallie Mae, a federal clearing house for student loan debt. This ‘government‑sponsored enterprise’, which was privatised in 1997, encouraged lenders to participate in the federal-loan programme. A lot of financiers lured into the financial-aid sector by the government’s guarantee increasingly offered loans outside the federal marketplace, which meant (in essence) that at the core of the mushrooming private-loan sector were lenders guaranteed a profit by the loans the federal government backed. Sallie Mae cheaply enabled the federal government to continue its historic indirect aid of higher education. The government only had to cover the interest payments while the student was in school. That sleight of hand was (and is) less expensive and more politically palpable than providing the money to underwrite colleges, universities and students. This strategy likely won’t end anytime soon. No one really noticed, for example, that 2010 healthcare legislation amendments included an end to the federal indirect student-loan programme. Why would anyone care about that rider? It didn’t come with funding for schools that could lessen their dependence on tuition. Most students and parents will still have to borrow money, either directly from bankers or the federal government. The US might have taken a historic step, following the Second World War, in making higher education available to the masses. But mass higher education in the US has always come with complicated financing, not simple funding.